Municipal golf suffers from a structural problem. In the 60s, 70s and 80s, municipalities built an enormous number of indistinguishable, monotonous golf courses. The price of these shoddy facilities is facing today’s taxpayer. America does not need more 18-hole, cookie cutter munis. What US municipal golf needs is forward thinking facilities: 9-hole courses, versatile practice facilities, par-three courses, etc. The chief advantage of these facilities is that they are cheaper to operate, placing less risk on the taxpayer. Your typical suburban muni golfer is constrained by time and price anyway - making these types of facilities the obvious fit for the local golf market. I have written about this topic previously. Today’s example is a course set amidst a golf-crazed community. And, it’s one near and dear to my heart: Lake Bluff Golf Club. Web Browning played the first round of golf at Lake Bluff Golf Club in 1968. I know this because Web Browning is my grandfather. He held the course record for a whole 20 minutes until the third group of the day came in. Twenty-eight years later, on my 10th birthday, I received a set of golf clubs and a $95 season pass to Lake Bluff Golf Club. For the following decade, I spent summers strapping my bag to my shoulders and riding my bike to LBGC, spending sun-up to sun-down playing and practicing. I learned to love the game of golf at Lake Bluff Golf Club. I'm one of the thousands of stories like this. Lake Bluff Golf Club has been in the news recently. The park district is "weighing its options" and deciding if golf is a part of the future of Lake Bluff. The Park District management denies that a decision has been made to close the course, but the writing is on the wall. In recent years, the golf course has been a loser on the balance sheet. Financial strains have made the budget tighter and placed the golf course squarely on the chopping block. In its current state, it's easy to see why Lake Bluff Golf Club should close. The design is boring and simple. There are dozens of other municipals in the area. The course conditioning is average and part of the property floods with moderate rain. The driving range was one of the most poorly conceived golf projects of the 2000s. Currently, 80% of the course's 27,000 rounds come from 10% (600 people) of the community. Despite extreme local loyalty, the course’s management company insists on cutting rates to compete on price for the GolfNow community. Lake Bluff Golf Club is losing money because the course fails to differentiate itself and doesn't fit what the community needs. Lake Bluff is situated amidst a crazed golf community. It sits on the northern border of Chicago’s affluent North Shore. The area is dripping with golf history. Just five miles to the south sits the tract of land on which C.B. Macdonald played the first version of golf in America. Within just a few minutes drive is a course originally laid out by MacDonald (Onwentsia), a Raynor masterpiece surely among the world’s best courses (Shoreacres), one of only three Harry S. Colt designs in the United States (Old Elm), a vintage Alison that is among the most underrated courses in America (Knollwood), a PGA Tour staple (Conway Farms), to say nothing of a number of other Donald Ross and William Langford designs nearby. Lake Bluff Golf Club is home to Lake Forest High School’s golf team, a perennial state championship contender. If there is anywhere that municipal golf should work, it's Lake Bluff. The existing golf course at Lake Bluff needs to go. But the city should not quit golf altogether. Instead, Lake Bluff should focus on quality. Right now it has a bad practice facility and 18 bad golf holes that flood. In its place, the park district should build a top-class practice facility and nine great golf holes that never flood. Shrinking the footprint of the course from 130 acres to 80 acres will help control costs. A practice facility will generate more revenue with less overhead than the existing area. What’s left of the 50 unused acres could become community space. Ideas that jump to the top of mind include a walking path, soccer fields and a hockey rink. It would make Lake Bluff Golf Club a place for the community, an excellent place to learn and play golf, and a profitable entity for the Park District. The northern suburbs of Chicago are devoid of good public golf and good public practice facilities. Lake Bluff has the opportunity to have both and become a destination. 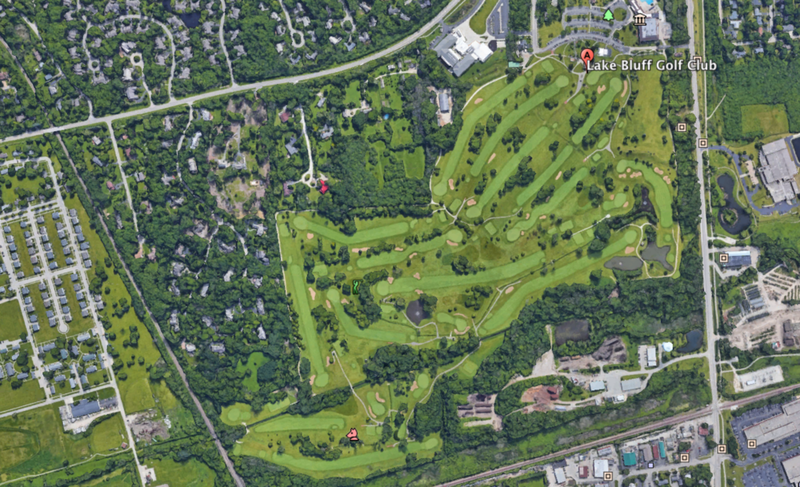 A quick survey of the landscape of public golf on the North Shore reveals a shocking number of public courses that look a lot like Lake Bluff. No public course or community has a world-class practice facility. Lake Bluff has a great opportunity to differentiate itself by being innovative and forward thinking. A world-class practice facility will attract a crowd from all over Chicago and provide a consistent stream of revenue. Building nine great holes will attract visitors from all over the world. If you don't believe that, look at Sweetens Cove, a nine-hole course in South Pittsburg, TN. The Rob Collins design attracts visitors from all over the world to rural Tennessee and even inspired an article from the New York Times. The dirty secret of it all, it doesn't cost a lot of money. You don’t need an 8-digit budget and a former major winner to design a high quality course. This is a lesson golf is slowly waking up to. In 2016, the city of Winter Park, Florida spent $1.2M to overhaul its defunct nine-hole course that was hemorrhaging money. In return, Riley Johns and Keith Rhebb delivered a great design that was built for the community. The design is so good that local country club members are opting for rounds at Winter Park rather than their club. Instead of losing $200k in 2017, Winter Park was profitable for the first time in decades. Beyond Winter Park, there is the Andy Staples-designed Rockwind Golf Course in New Mexico. The broken 18-hole course logged less than 13,000 rounds per year before it was redesigned in 2014. The first year after opening its new community-focused golf course, Rockwind logged 25k and has held steady since. There are a handful of other success stories of innovative projects and communities who have invested in the right type of golf. Unfortunately, the vast majority of communities don't have the right situation or make poor decisions that lead golf to fail. Perhaps it’s true that many communities need to shudder their golf courses. Lake Bluff is not one of those communities. Lake Bluff needs to invest in the right type of golf.